Humility to virtues, it is often said, is like a root to a tree. A tree could not grow strong, bear fruit, or live a long life unless its roots are established deep in the ground. The branches of humility are modesty, unpretentiousness and respect. Therefore humility, defined as being free from pride, is primary for all those seeking a strong enduring relationship with the Lord Jesus Christ. Humility, once firmly established, makes the foundation for wisdom strong . King Solomon famed for his wisdom said, "When pride comes, then comes shame; but with the humble is wisdom" (Proverbs 11:2). David the Prophet and King said, "The testimony of the Lord is sure, making the wise the simple" (Psalm 19:7), "the simple" referred to here being the humble. In the Holy Book of Sirach we read, "A poor man with wisdom can hold his head high and take his seat among the great" (Sirach 11:1). Again, the poor man in this verse refers to the humble. Why humble? The poor man knows he is poor, is patient when misfortunes strike him, blames himself in everything and does not care about the opinion of others because his aim is simply to please God. St. Pachomius, the noted founder of coenobitic monasticism, said, "Be humble so that God guards and strengthens you, because God looks to the humble. Be humble so that God fills you with wisdom, knowledge, and understanding, because it is written that He guides the humble and teaches His ways to the meek." Also St. Pachomius said, "Be humble in order to be joyful, because joy goes hand in hand with humility." The childhood of this humble saint, Abba Anthony, is one of necessary contemplation by children and youth today. Some saints were born saints; others were saints from their mother's womb (St. John and Jeremiah the prophet). These saints were among the highest levels of saints, a gift from the Lord. St. Anthony was not born in this class of saints. He was a youth born to a noble family attributed for their great wealth. 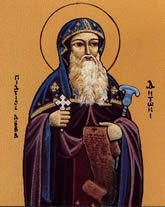 St. Athanasius the Great wrote much concerning the family and childhood of St. Anthony. Our saint was an Egyptian, a descendant of a slave-owning family. His forefathers were believers in the Lord Jesus Christ and therefore from his earliest childhood, St. Anthony, was blessed by having been brought up in the fear of the Lord. As a child reared up in the secular world, he knew nothing of his father's business or of what went on among his kinsmen. He was so silent in disposition and his mind was so humble that he did not even trouble his parents by asking them questions. He was exceedingly modest and honest beyond measure. When he attended church with his parents he would run before them to the church in an outflow of his affection. St. Anthony never neglected or held lightly the observance of any of the seasons of the church neither in his childhood nor in his early manhood. Since childhood until he began to distinguish between good and evil; his going to church was not a mere custom, but the result of discernment and understanding. As a child and a young man, St. Anthony looked up to his family as his teachers, paying them honor after the manner of a full grown man, and they, at their old age, regarded him as the master of the house until their days came to an end. When St. Anthony became an adult, he made the eastern mountains and desert his home; continually having to strive to overcome great obstacles in his attempt to achieve the highest level of sainthood. He desired to prove his love to God and his readiness to exhaust every effort to live in unity with God by leaving the world voluntarily, giving all his wealth to the needy; so that he could live the life of poverty, he had believed, would assist him to gain the earthly life nearest to the Lord, he so ardently wanted. In all St. Anthony's earthly accomplishments and fame, he retained his humility. As St. Makarius in one of his contemplations said that he saw demon's lures scattered all over the earth and asked, "Lord, who can escape it?" And following this question, St. Makarius heard a voice answering, "The humble will." St. Anthony's humility took many forms. From childhood, St. Anthony listened to others without insisting on his own opinion. As an adult, St. Anthony committed himself to solitude and practiced it by living enclosed for twenty years during which he did not see a single human face. This, it is thought, is the life he had preferred. Yet, following many years in the desert, when people gathered at his door, asking to see him or hear his teachings, he did not turn them away even though he wanted to remain in the life of complete solitude he had chosen for himself. He instinctively knew he must replace his preferred way of life and begin to teach monasticism, opening his door to all that wanted to visit. He thus changed his life style for the sake of others; and with wisdom accepted what God wanted him to do. St. Anthony believed monasticism entailed abandoning the world and living in the desert in prayer and meditation. However, when bishops called upon him to go to Alexandria to fight Aranism, he went to the city and stayed with the people for three days until his mission had been accomplished. Only then did he return to his solitude. He was obedient and did as he was told although he was about one hundred years of age at the time. Another act of humility encompassed visiting the martyrs awaiting trial and torture. He gave them his support and encouraged them. Further, with humility St. Anthony overcame stringency and stubbornness normally associated with isolation. His modesty created gentleness in him. He flexibly exercised wisdom, increasing moderation and discernment with himself and others. He became happy and joyful in his humility and kept it a central part of him till the end of his earthly life. During the time of St. Anthony, the Egyptians were in the habit of taking the righteous men's corpses especially those of the blessed martyrs, embalming them and placing them not in graves but on biers in their houses; for they thought that by doing so, they were doing them honor. When St. Anthony got sick,he instructed his two disciples who had been with him the last fifteen years to dig a grave for him and never to tell anyone one where they would bury him. "...and there I shall be until the Resurrection of the dead". Humility, even unto death, was St. Anthony's last wish, following the example of the deaths and ground burials of the holy Apostles. St. Anthony further gave instructions for his meager possessions. "Divide my garments into lots and give one leather tunic to Bishop Athanasius and the covering of this my bed which he gave to me when it was new; but now it has the age of many years. And to Bishop Serapion do ye give the other leather coat; and this covering of my bed which is made of hair you yourselves shall keep." His only possessions taken care of, he instructed his disciples to abide in the peace of the Lord Jesus Christ, and his face became full of joy unspeakable. With heavenly joy upon his face, St. Anthony departed from this world. The disciples wrapped around him the garment which he had wore, dug an unmarked hole, and buried his body without ceremony. To this very day no man knows where they had buried him except the two disciples who had laid him in the earth. In quiet finality was the end in the body of the 105 years of the blessed St. Anthony, a great man of God who from his earliest youth to his old age never strayed from the Lord his God. Many youth have often asked why St. Anthony did not become a bishop; yet he was a contemporary of bishops. During the day of St. Anthony it was not mandated that bishops should be chosen from among monks. In addition, during St. Anthony's time, monasticism was regarded as a spiritual order beyond the realm of pastoral care. It was a life considered better than priesthood and closer to that of the angels. Given those facts, who would quit monasticism to become a bishop. As stated earlier, one of his famous disciples who wrote his biography was a deacon and became a Patriarch, St. Athanasius the Apostolic. Today, our beloved popes are followers of the monastic life and St. Anthony's legacy, of great humility serving the papacy; preserving the same spiritual virtues as St. Anthony the Great. Today, our popes and their predecessors examples are again supporting the evident; that great humility in life renders ever greater wisdom in service to the Lord Jesus Christ. Ephram El-Souriany said, "Inside the meek and humble man, the spirit of wisdom rests." This is such an astounding quote when put in perspective regarding the life of St. Anthony, who he had no guide. He had little childhood formal education. There were no books he could research in order to self educate himself in the desert. He was alone throughout most of his spiritual quest without companions; but did not fall once. He had complete faith in God, the longevity of his life from childhood till death believing that God was with him. He obtained his strength from deep within himself and had the courage to enter into the uncharted unknown in the search of angelic worship. His humility conceived his wisdom. Today, we commemorate St. Anthony the Great not only on his feast but also in the commemoration of the saints in our Divine Liturgy and in the Midnight Prayers. Methodius (c290) an Ante-Nicene and bishop of Lycia wrote, "All the bodily members are to be preserved intact and free from corruption. This means not only those members that are sexual, but those other members too that minister to the service. For it would be ridiculous to keep pure the reproductive organs, but not the tongue. It would be ridiculous to preserve the tongue, but not the eyes, ears, or hands. Lastly and importantly, it would be ridiculous to keep all these members pure, but not the mind, defiling it with pride and anger." May the prayers of the great St. Anthony who sought holiness in solitude, willingly became an obedient and wise teacher, whose humility bore gentleness and goodness be with us all, Amen.